Catriona Shearer Event Host & Presenter for Awards & Presentations. Catriona is a Scottish journalist, broadcaster and producer, best known as a presenter for BBC Scotland’s national news programme. Cat is the presenter of the morning bulletins on BBC1 Scotland so hasn’t had a long lie for nearly two years. She also presents the lunchtime edition of Reporting Scotland once a week. Prior to TV news, Catriona’s first on-screen presenting job was the online video podcast for BBC Scotland called News Weekly. 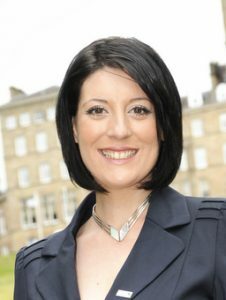 Newscaster turned quizmaster when Catriona presented a radio quiz series for BBC Radio Scotland called ‘Soundbiters’. A keen music fan, she indulges that passion presenting the New Music Zone for BBC Scotland and revels in uncovering the next big thing for herself and the listeners. Before joining the team in Glasgow, Catriona worked in Cardiff for BBC Radio Wales and co-presented the Saturday afternoon Sports programme ‘Sportstime.’ She still hasn’t quite mastered those tricky Welsh pronunciations. She worked as a producer across their light entertainment/lifestyle/music output despite the occasional language barrier. Catriona’s journalistic career began after graduation in 2005. Swapping Edinburgh for London she worked as a journalist/producer on BBC Radio Five Live’s Breakfast programme, where she developed her journalistic skills but most importantly, her aptitude for getting up early.